Cast: 4 adults (2m., 2w.) and 10 teenagers (4m., 6w.). Expandable to 35, plus extras as desired. What is a family? Playwright Sandra Fenichel Asher traveled the country running workshops in which teenagers and adults pondered that question and experimented with monologues and scenes based on significant events and interactions in their own families. The resulting script is a montage that gives every member of its large cast challenging opportunities for both solo and ensemble work. Family Matters presents the “full catastrophe” of family life, embracing its comic, dramatic, farcical and tragic realities. In the first section, “Talk,” the eldest son of the core family reveals to his mother that far from his model student image, he’s on the verge of flunking out of school; another mother regrets never telling her child the truth about his birth father; and the core family’s rebellious daughter and her dad find it difficult to communicate in even the most superficial way. “Secrets” dips into the private worlds that three teens can reveal to only their very best friends, worlds darkened by abuse, mental illness and sexual assault. “Stuff” deals with the impact of “a look, a touch, a word, a smile” on teens and other family members as they attempt to reach out to one another. 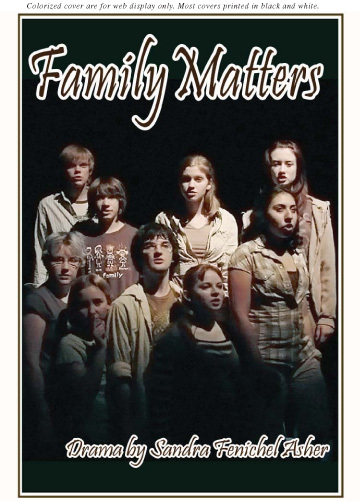 Family Matters was commissioned by the award-winning Youth Theatre at the U (University of Utah) and premiered at the Babcock Theatre. It was selected for further development as part of the Open Eye Theater’s Bear Bones Series, funded in part by an Aurand Harris Grant from the Children’s Theatre Association of America. Area staging. Approximate running time: 90 minutes.